The code red in NFL circles is the growing liberation consciousness of the ones people pay to see. A great deal of the angry energy generated in America through the coming apart of the 1960s was absorbed by SportsWorld in its various roles as socializer, pacifier, safety valve; as a concentration camp for adolescents and an emotional Disney Land for their parents.… SportsWorld is a buffer, a DMZ [demilitarized zone] between people and the economic and political systems that direct their lives. These quotes have been crawling under my scalp in the aftermath of the decision by the National Football League to fine teams if their players do not show “proper respect” during the national anthem. Much of the analysis of this by righteously rageful critics of ownership is that this decision was a capitulation to Donald Trump; that these billionaire masters of the universe fear Trump; they fear the hive-mind control he has over his political base and its ability to collectively hurt ratings, attendance, and bottom line profits. NFL owners, this critique goes, want to get their league out of Donald Trump’s mouth at all costs, so they meekly submitted to his wishes. 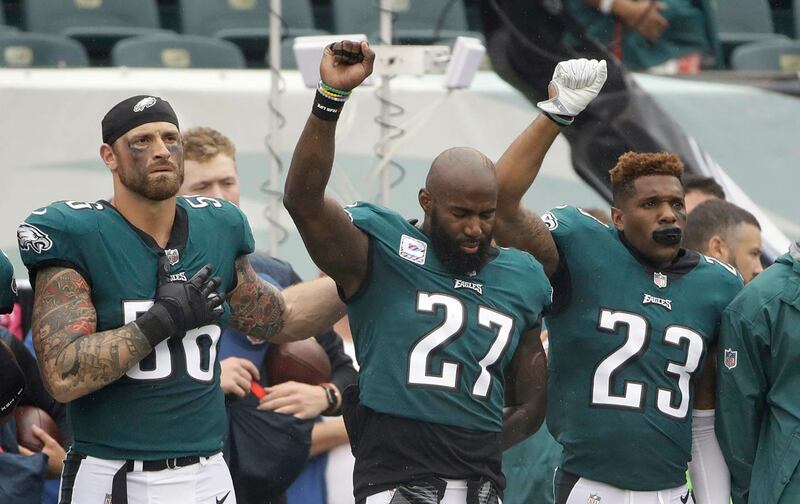 Evidence of their weakness in the face of his bullying bombast was seen, as football scribe Melissa Jacobs pointed out, in the pathetic spectacle of Roger Goodell saying absolutely nothing when the Super Bowl champs, the politically active Philadelphia Eagles, were disinvited to the White House by Trump, even though not one Eagles player took a knee during the anthem last season in protest of racial inequity and police violence. It was, Jacobs correctly points out, an unabashed embarrassment that NBA Commissioner Adam Silver spoke out immediately in defense of socially engaged athletes while Goodell remained silent. Yet I disagree with the analysis that this new rancid policy of coercive patriotism was enacted because NFL owners are in full surrender to Donald Trump. Yes, they are afraid—very afraid—but it is not fear of the orange golem in the White House that has driven this new policy. It is fear of political athletes. It is fear of labor. It is a fear not rooted in a loss of profits—the Carolina Panthers just sold for over $2 billion, for goodness sake—but in a loss of control. This is polarizing, enraging in some quarters, and political red meat for Trump’s frothing base. But for NFL owners, the threat is far more daunting: To them, it’s players refusing to be mere extensions of equipment on the field or robots advancing the ball. It’s players noticing, as Michael Bennett of the Eagles has written, that the league is not in fact integrated. It’s segregated, with mostly black bodies taking all the risk, pain, and traumatic brain injury, while an almost entirely white ownership class reaps the rewards. NFL owners are willing to look soft and foolish. They are willing to look like Trump lackeys. They are willing to be mocked if it accomplishes a broader objective: making sports be again a demilitarized zone between people and their lives. Their aims are nothing less than to stop, by any means necessary, the invasion of the real world—with all its racism, injustice, and creeping authoritarianism—into the sports world. If these owners have to be racist, unjust, and authoritarian to accomplish these aims, then so be it, irony be damned. This is the code red: The players are tasting independence as well as a sense of their own power, and that cannot be tolerated, no matter who is in the White House.